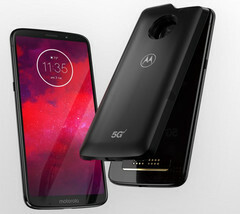 Motorola's 2018 flagship, the Moto Z3, will have an optional 5G add-on modem in the form of a Moto Mod that will connect to Verizon's upcoming 5G network. The Z3 uses last year's Snapdragon 835, but this helps to keep costs down. Motorola is claiming to be the first to provide a 5G mobile experience with their new Moto Z3 with 5G Moto Mod (sold separately). The Moto Z3 is launching as a Verizon exclusive, and its party trick is a 5G Moto Mod (with 2000 mAh battery) that adds a 5G modem that compliments the internal 3G and 4G modem. Exclusive partnerships can be annoying, but there is some sense in this one. While the Moto Z3 will be the first phone to bring 5G capabilities to US consumers, Verizon will also be the first mobile network provider to roll out a public 5G network. That network will hit Houston, Los Angeles, Sacremento, and a fourth as-yet-unnamed city. The spec sheet looks about right for a Moto Z flagship. The series is focused on bringing modern features to a lower price point and using last year’s flagship Snapdragon 835, along with a more pedestrian 4 GB of RAM, helps achieve this goal. The price puts it within reach of more powerful phones, such as the OnePlus 6 or Huawei Honor 10 depending on configuration. But Motorola has the advantage of being available in US carrier stores and therefore is likely to be included in contract bundles. The Moto Z3 launches on 16 August at a retail price of US$480, but Verizon is offering up to a US$300 discount for those switching to their network and trading in their old phone. The 5G Moto Mod is sold separately and the price wasn’t available at the time of writing.